Money makes the world go round- especially in political campaigns! Join us today as Tina and I discuss how to ask for money in a political campaign. Whether you are nervous about asking people for money or you are just looking for tips on where to start, we’ve got all the information covered for you. If you are going to run for local political office, then you are going to have to learn how to ask! You will need to ask for people’s vote. You will need to ask for their support. You will need to ask for people’s time. 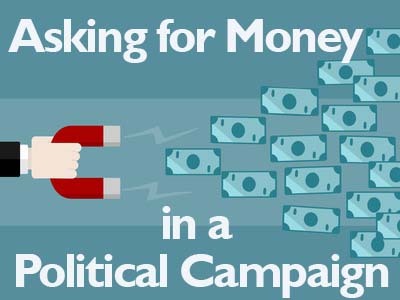 Learn the basics today as we go over how to ask for money in a political campaign. This entry was posted in Podcasts and tagged asking for money, political fundraising, running for local office. Bookmark the permalink.